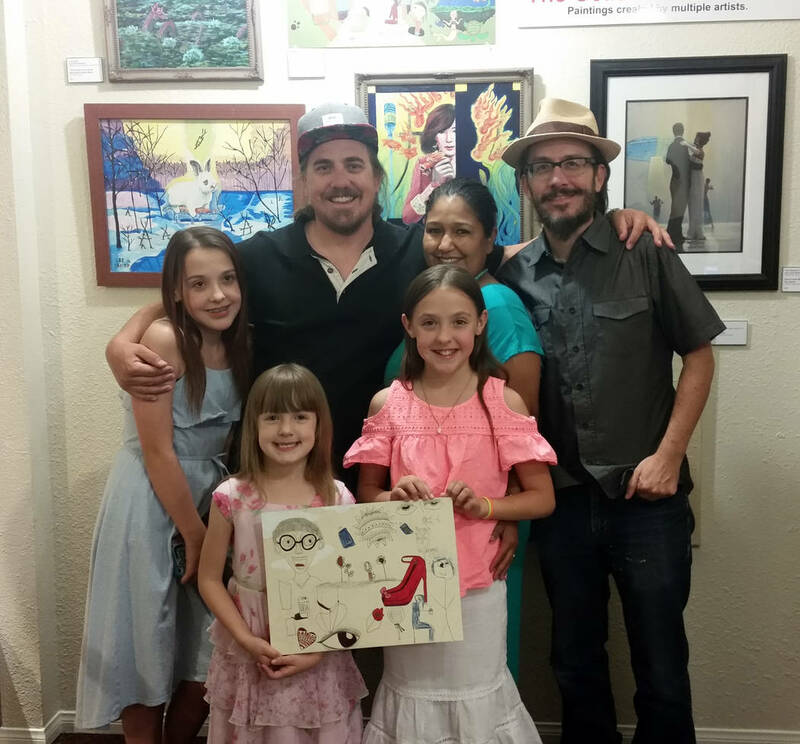 For the month of June, people in Boulder City can enjoy “The Collaboration Show” at the Dam Little Art Gallery, featuring single pieces of art created by multiple people. Celia Shortt Goodyear/Boulder City Review The Dam Little Art Gallery is hosting "The Collaboration Show" in June, showcasing works done by more than one artist, including a piece created by show organizer Neil Kesterson, back row, second from left, and his family, front row, from left, Penny Kesterson, Emmy Kesterson, back row, from left, Sophia Kesterson and Sarah Florang. At back right is Lee Lanier, who co-organized the show. Organizer Lee Lanier said the inspiration for the show came from all the art that every artist has that hasn’t been finished or lost interest in. Lanier and fellow organizer Neil Kesterson said they had collaborated on pieces of artwork before, with one of their first being a painting, “Picasso’s Lonely Journey to the Fifth Dimension.” It’s an abstract piece that Kesterson started and Lanier finished by putting in a portrait of artist Pablo Picasso in the Spaniard’s cubism style. By trading and sharing, they were able to gain new inspiration and create more original art. They also used artwork from garage sales, thrift stores or trades. Then they had the idea to utilize the open wall space in the Dam Short Film Festival office and create a show featuring those types of pieces from other artists. Some of those other artists were Kesterson’s family, who created an original painting, “5 Girls in Fantasyland (a.k.a. Family Collaboration #1),” for the exhibition. His three daughters — Sophia, Emmy and Penny — drew and painted different parts of the piece. One would draw something and another would add something else to it, and then they’d continue from there. Emmy created a majority of the faces in the painting. Sophia drew women, bodies, pencil, eyes and eyebrows. Penny did a lot of the random drawing including a ginger ale bottle, flowers, two ladies and a necklace. She said her inspiration for the ladies in it was the game Plants vs. Zombies. Kesterson’s girlfriend, Sarah Florang, also contributed to the painting and created flowers with her daughters’ initials so that they could be included because they were not able to add to the artwork itself. “It was a lot of fun, working on it as a family,” he added. Kesterson and his family are currently creating a second collaborative piece. “The Collaboration Show” will be at the Dam Little Art Gallery inside the Boulder Dam Hotel through June 28. Admission is free. The Dam Little Art Gallery’s next show is its “Summer Exhibition,” from July 1-31, which will feature international works of 2-D art, with an emphasis on technical proficiency and originality.